Harbor View Hotel is currently undergoing an exciting renovation. The hotel will reopen on May 1, 2019, and will offer enhanced facilities, services, and amenities that honor its iconic history while providing a world-class experience. Since its opening in 1891, Harbor View Hotel has been nicknamed the “Grand Dame” of Martha’s Vineyard, and introduced a new era for Edgartown and Martha’s Vineyard. With an extraordinary view of Edgartown Harbor from the hotel's broad veranda, Harbor View Hotel became a summer haven for wealthy New Yorkers visiting the Vineyard. Faced with 100,000 cedar shingles imported from New Brunswick, Harbor View Hotel offered guests the modern conveniences of the day, including a single telephone line and gas lights. Since then, Harbor View Hotel has welcomed generations of families to Edgartown and the Vineyard, building an extremely loyal following of returning guests. Charming and sophisticated, the 114 beautifully-appointed guestrooms at the Harbor View Hotel are individually decorated, offering a personalized warmth; select rooms include spectacular views and private porches. Guests can spend relaxing days and unforgettable nights at Henry's and the Lighthouse Grill, dining on the freshest local seafood and savoring a glass of wine. Experience a discreet, relaxing, and exclusive atmosphere for meetings, banquets, and special occasions at Harbor View Hotel; made even more special by timeless hospitality and a unique location. 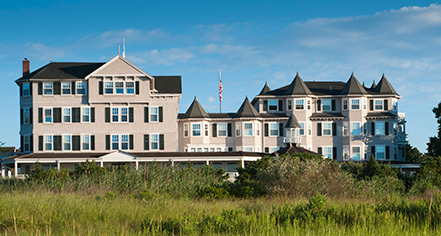 The Harbor View Hotel is ideally located on Martha’s Vineyard in Edgartown. Guests have access to a private parking area, and seasonally to the outdoor heated pool and resort events through the Concierge. Access to local biking and jogging trails, as well as great Edgartown shopping, make the Harbor View Hotel an ideal place to stay in Martha's Vineyard. 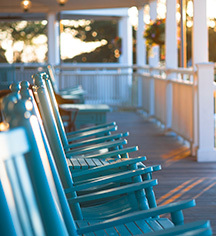 The gracious wooden rocking chairs on the hotel’s veranda are comfortable posts from which to enjoy panoramic views of the harbor, lighthouse, and distant Chappaquiddick. Airport Transportation: Complimentary Airport/ Ferry Transfers. Cancellation Policy: Varies by season. Deposit: 3 nights or less, the hotel takes the full amount of the stay as a deposit. 4 nights or more, the hotel takes 50% of the entire stay as a deposit. Hotel/Resort Fees & Taxes: Taxes: 9.7%. Pet Policy: Service animas allowed: Yes. Pets allowed: Yes. Fee: $50 per night. Learn more about the History of Harbor View Hotel of Martha's Vineyard .